Giphy today launched its own iOS keyboard, called Giphy Keys, that will let users search for and send GIFs without having to navigate to a separate keyboard application. 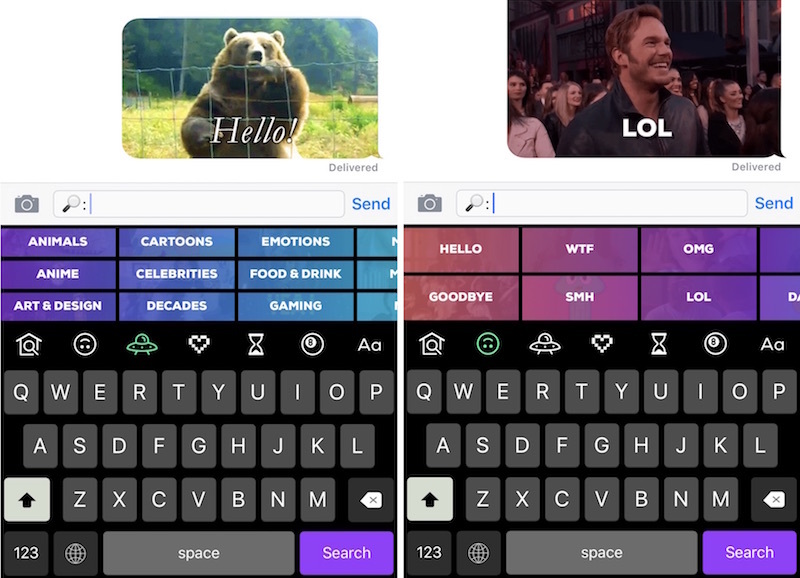 Once users install Giphy Keys as a new keyboard in settings -- and allow it full access -- the app can be selected as a keyboard by tapping the globe icon whenever the keyboard is open on iOS. The advantage of Giphy Keys is that anyone who constantly navigated through multiple keyboards to type messages and search for GIFs can now do both in one place. The top of the keyboard has a search functionality to find a GIF related to a specific topic, but Giphy also provides various categories related to moods or trends whenever you don't have a specific GIF in mind. GIPHY Keys is the easiest and fastest way to browse, search, and share GIFs in your text messages -- right from your keyboard! Not only do you have access to GIPHY's collection of millions of GIFs, you can play with our special GIPHY commands to make and discover so much more awesome content. Similar to other GIF apps, once a user finds their desired GIF, all that needs to be done is a simple copy and paste into the message field and then hit the send button. Giphy Keys also introduces a new 8ball tab, where users can ask the app a question and receive an answer in GIF form. The section also gives weather forecasts for specific zip codes, and can animate words and phrases, all with GIFs. For users who integrate GIFs into every corner of their iOS messaging experience -- from iMessage to Snapchat and other clients -- Giphy Keys should be a helpful addition to their daily perusal and sending of the popular animated format. Those interested can download Giphy Keys from the App Store for free [Direct Link]. This is no different than any other GIF app. They all have search and they all have normal keyboards too, I don't get it. None of them have autocorrect, so you'll always have to switch back and forth between a GIF app and the keyboard app. So just use whichever GIF app you prefer. This one brings nothing new to the table. A little clunky at the moment but I think this will be replacing my other keyboards. Looking forward to trying it out further. I wish I wouldn't have to paste, that the keyboard could insert the image just like a letter or word. (Same for bitmoji, etc).